Have you ever watched a series that started out with amazing promise and kept you tuning back in for each episode…even though you couldn’t help but notice you were enjoying yourself less and less as the story progressed? Well, that’s Monster. Review over, good job everyone. 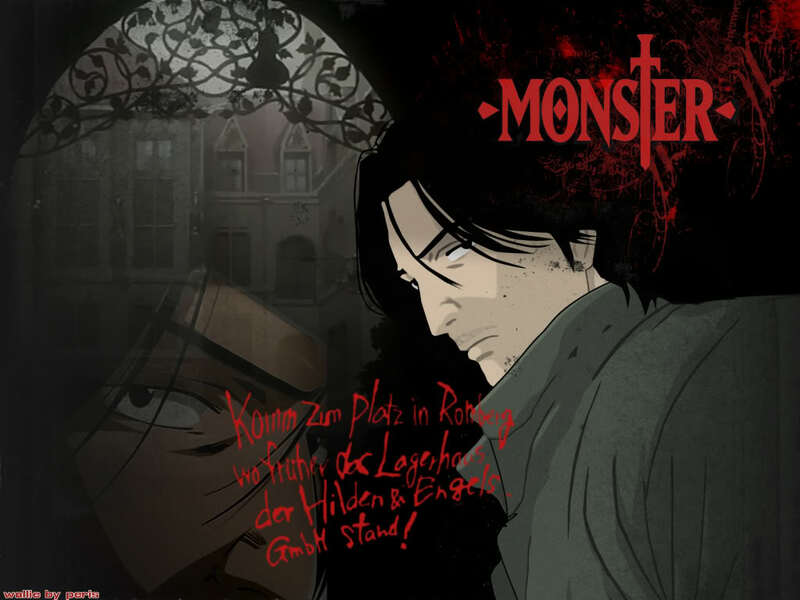 In all seriousness, Monster grips you very quickly and keeps you entertained for the entirety of its first half via impressive use of plot developments and characterization. Unfortunately, it loses track of what is important in its second half and falls back down into the territory of the mediocre, and in this review I’ll try to explain why I think that happened. 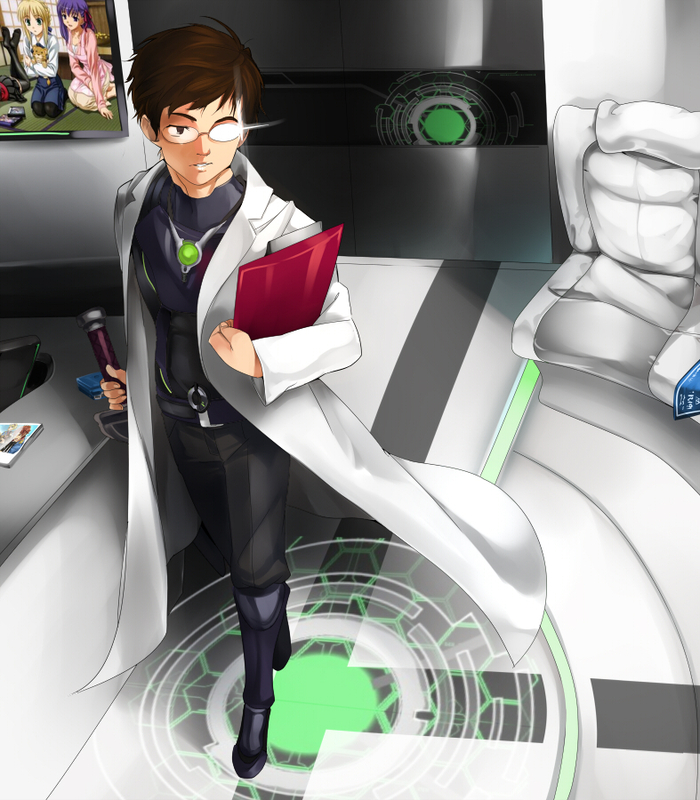 Kenzo Tenma is a talented Japanese neurosurgeon living in Germany. His success rate is phenomenal, he is engaged to the hospital director’s daughter, and life couldn’t be going any better for him…until he saves the life of a young boy called Johan. What follows is a tangled skein of intrigue and death, with Tenma alone in a position to put an end to it all. With his career and relationship destroyed, he will stop at nothing to put right the wrongs he has allowed to occur. For on that fateful night he did not simply operate on a child…he resurrected a Monster. If you haven’t picked up on it already, I was disappointed by Monster. To begin with it seemed fantastic, weaving together an interesting but realistic mystery (with some fairly accurate medical lingo thrown in!) that easily fended off boredom night after night. Each episode proffered just the right amount of new information; enough to draw you deeper into the rabbit hole and keep you guessing without drowning you in facts. And perhaps its greatest achievement was the inclusion of multiple stand-alone stories as Tenma progressed through his journey, introducing new characters or scenarios that you actually cared about by the end of their single episode. The word “impressive” barely begins to describe the quality of the writing that was able to do such a thing. In addition to all of that the story, the mystery and the character motivations all made sense in a real life context. And then things just sort of fell to pieces. I can’t pinpoint any one episode where Monster stopped being “Great” and was demoted to “Good”, but I can confirm that the downward spiral of quality didn’t stop there. It began to present characters that drew attention away from the individuals the series had followed up until that point and yet also lacked the charm of the relatively unimportant inclusions it had used previously. Whereas to begin with I had felt engaged with just about everything that was going on, I started to drift back as I lost sight of the people I was interested in for many episodes at a time. It probably would have been fine if the story had managed to build these new characters up to the level of Kenzo and the other regulars, but it dumped them by the wayside and moved on almost before I had even noticed the fact. This is terribly difficult to explain. I mentioned in the introduction that the series seemed to lose focus and that’s probably the most succinct description of what occurred. In addition to flip-flopping around with its characters, the plot itself seemed to stretch out well past its logical conclusion to become something that didn’t have that tantalizing mystery-realism that had made the first half so entertaining. “Important” events concluded and were discarded as swiftly as they were introduced and failed to have any real impact on the story as a whole. 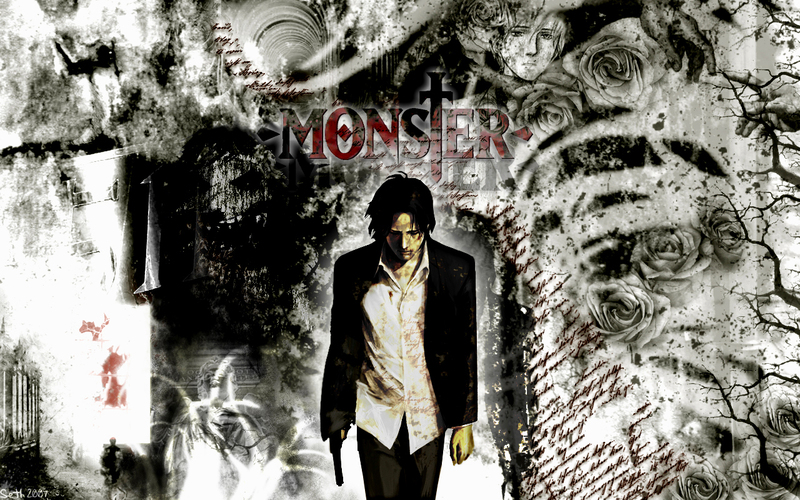 Even the major plot twist elicited an uninterested shrug from me before Monster promptly moved on and left it behind. The last thing I want to add to this section is that for a dark mystery/thriller series called Monster the antagonist doesn’t seem all that monstrous…just sayin’. One of my favorite aspects of the show is its art. 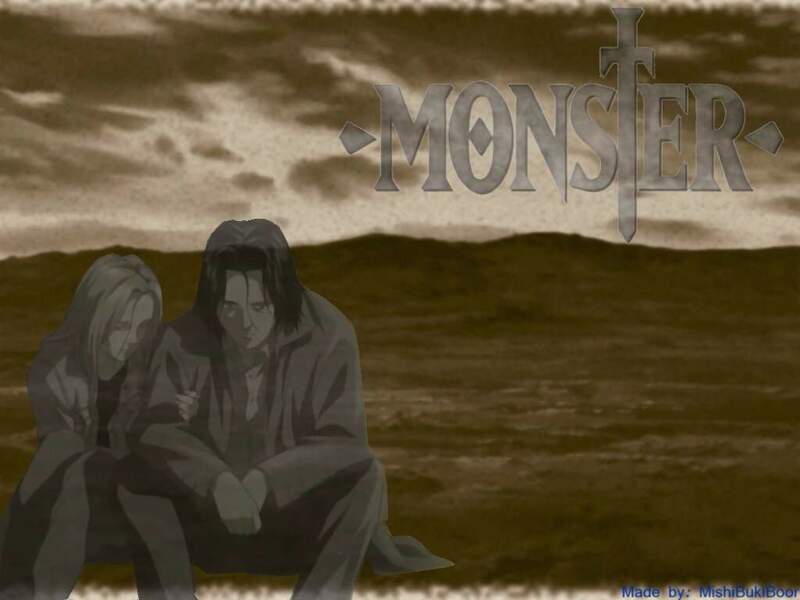 It’s hands down the best take on gritty realism that I’ve seen in anime, and for having been done in 2004 Monster looks wonderful. The character designs, and faces in particular, are especially noteworthy, bestowing on each character a unique sense of individuality while maintaining their believability as real people. Given today’s general lack of defining features I was absolutely blown away by what Monster had to offer. The musical score works well for the series and its director knows how to use silence to good effect in addition to how to match tracks to the intended feeling of the scene they are to be used in, though I have to say that I wouldn’t listen to a single one outside of my viewing times. Summary – To begin with Monster is delightful, with an excellent take on the realistic thriller/mystery genre that succeeds in every aspect I look at when reviewing; I wouldn’t say it was riveting but I was consistently entertained. If the series had ended thirty episodes earlier I would have been a very happy viewer. However, much like an aging person, Monster loses focus as it approaches the end of its life and everything that made it likeable in the first place gradually fades away. It lacks the impact that would have allowed it to finish with a bang, or even a pop, and even reaching its conclusion felt like a struggle. This entry was posted in Anime Reviews, Reviews and tagged Anime, Madhouse, monster, Review. Bookmark the permalink. ‘I can’t pinpoint any one episode where Monster stopped being “Great” and was demoted to “Good”’ – For me it was after the library fire. 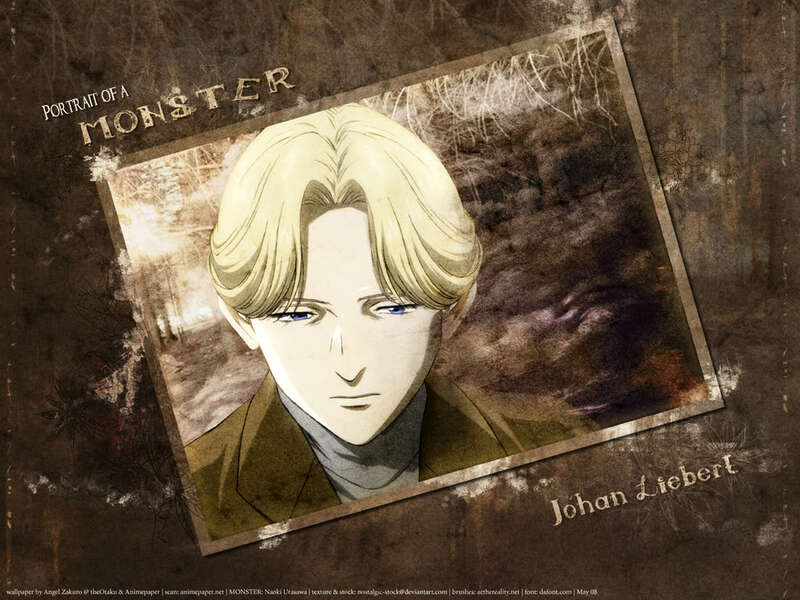 With a few mentions of the red rose mansion in a conclusion, they could have easily cut and pasted the Johan’s flashbacks after that scene and nothing much would have been left out. In the end, his “hypnotic manipulation” of people, even though compared to Hitler’s charisma or whatever, is the most unrealistic part of the show but was needed to justify all of the strangeness that happens in it. Yeah, that’s probably the most appropriate point to choose. There were some good points after that, certainly, but even the Red Rose Mansion didn’t add much to the story. I suppose the idea is that he’s a monster because he does all of that stuff without feeling any emotion about what he’s inflicting upon other human beings, but to be honest there are far scarier attributes for villains to have. It’s not like he’s particularly cruel or savage or anything…he’s just a calm and collected psychopath without any major goals. Even compared to real life examples that’s pretty tame.